Edison State students and members of the audience raise their hands to indicate they had been victims of bullying during their lives. 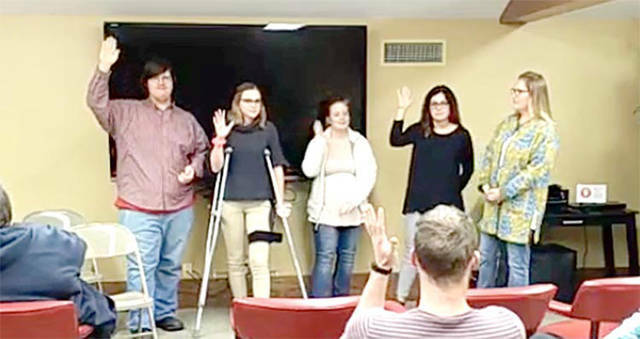 Pictured (l-r) are Edison State team members at the Greenville Public Library, Christopher Bucklew, Baylee Petry, Renee Netzley, Hope Byrum and Dawn Cleere. GREENVILLE – Edison State Community College took an anti-bullying message to community members throughout Darke County. Thirty-six Edison State Fundamentals of Communication students from the Darke County Campus – composing eight teams – went off campus with their final speech presentation in December. They talked to Greenville Middle School students, Ansonia Elementary students and adults, many with children, at Greenville Public Library. Their message went to nearly 400 students while the library presentation was open to the public. It is on the library’s Facebook page, having received nearly 350 views. The primary message to students was do not participate. If someone tries to bully you, walk away and tell an adult. The same message applies to “bystanders,” students who may see someone being bullied. Get involved, but don’t participate; tell an adult. If it keeps up, they added, talk to a trusted friend or get the authorities involved. The students talked about the four types of bullying – physical, verbal, cyber and exclusion – and the effect it can have on the victims. It can result in depression, withdrawal, skipping school or, in some cases, even thoughts of suicide. While research indicated one in three students acknowledged being bullied, a show of hands during presentations indicated as many as four out of five had been victims of bullying. According to many sources, the problem reaches epidemic proportions. Edison State communications students have a required off-campus team presentation using the skills they have been learning each semester. In the fall the topic is bullying. In the spring it is drug abuse, and in the summer it is literacy.